Urban green spaces can provide a neutral space within which people come together, social interactions occur (that include people from different backgrounds), and relationships or partnerships take form. While personal goals or desires are achieved, community building and increased social capital also emerge, particularly if people share work on a project or goal. Individual benefits, improved public health, and social resilience are potential positive outcomes. cite: Wolf, K.L., and M.A. Rozance. 2013. Social Strengths - A Literature Review. 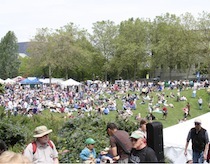 In: Green Cities: Good Health (www.greenhealth.washington.edu). College of the Environment, University of Washington. City parks, gardens, and open spaces are often filled with people of all ages and backgrounds looking for a brief respite from their bustling urban lifestyle. Public green spaces draw people for many reasons: to relax, find inspiration, exercise, and to gather with friends and family. While there, they inevitably interact with others, be it a smile in passing, joining in informal discussion, or play. These seemingly banal and unimportant social interactions can contribute substantially to community enhancement. Researchers and social theorists have looked at the relationship between urban green spaces and community building. From casual interactions to organized events, urban green spaces can provide a neutral space within which people gather, people from different backgrounds come together and interact socially, and where relationships and partnerships take form. While personal goals or desires are pursued, community building and increased social capital also emerge, particularly if people share work on a project or goal. A sense of connectedness fosters greater trust and cooperation among individuals, potentially leading to greater community resilience in the face of adversity. These social dynamics help promote community wellness and social cohesion, critical components of a well-functioning society. People regularly gather together to accomplish a goal, relax, recreate, or enjoy a physical space. It is through these different interactions that community is formed. Community can result from the creation or enhancement of a place shared by neighboring individuals (such as a physical neighborhood community) or it can arise from the creation of a club or association in which individuals share a common interest or activity. At the core of every community are individuals that share values, ethics, or beliefs. Some types of community are defined by the level of social cohesion or interrelatedness among individuals, whether residing near each other or not.9 Community may also form around purpose; it can be a collection of people with differing but harmonious views, skills, perceptions, and so on who can, with some outside stimulus (e.g., funding, professional advice, or associated groups), develop in a cooperative way to achieve valued outcomes.10 For example, a “business community” is a group of individuals that share economic interests; programs or actions define their connections. Following the industrial revolution and modernization, cultural theorists recognized that the basis of community underwent a transformation.19 Toennies observed that the focus of community dynamics changed from kin and small group interpersonal loyalties (termed Gemeinschaft) to relationships that are chosen to promote individual self-interest (or Gesellschaft). The previous village-based social fabric was weakened due to cultural emphasis on capital and business efficiency.Durkheim held a more positive view on societal change, but was concerned about the onset of “anomie”: that social norms and values would be so weakened that individuals felt little moral guidance or ties to society. In Bowling Alone, Robert Putman wrote about the ongoing decline of a sense of community in current times.23 Putman identified contemporary forces and patterns and ascribed decreasing rates of participation in social organizations or community activities to an increase in individualistic behavior. Decreases in time and money, increased suburbanization, generational changes, and electronic entertainments are conditions that he proposes have lead to reduced sense of community and lower social cohesion relative to previous decades. Why is an analysis of community important? Why would community leaders be interesting in building more opportunities for interaction, cohesion, and thus increased social capital? Inner-city residents living near green common spaces spend more time in that space than other residents with treeless common space.2 Additionally, the more time people spent in this common space, the better they knew their neighbors and the greater their sense of community. Some communities experience disruptions (such as loss of a major job providing industry) or a catastrophic disaster (such as hurricane damage). Recent studies are exploring how community-based natural resource management is important to disaster relief and recovery.55 Humans, faced with a disaster, as individuals and as communities, often seek engagement with nature, working together to restore the built environment, including parks and memorials. Urgent biophilia refers to the purposeful contact with green space that supports human efforts to summon and demonstrate resilience in the face of a crisis.56 The affinity (or biophilia) that humans have for nature, the process of remembering that attraction, and the urge to express it through creation of restorative environments may confer resilience across multiple social scales, from individuals to neighborhoods and entire cities. Community gardens are often grass roots initiatives and can transform dilapidated vacant lots into usable garden spaces, turning community liabilities into assets. The gardens are often started through existing community networks and once created, continue to strengthen social ties.20,22,57 Studies of the social dynamics of community gardens illustrate the relationships between urban greening and community building. History of Community Gardens in the U.S.
As people express their mutual values within garden spaces, relationships are created and strengthened among different groups of people.59 Immigrant communities, such as Puerto Ricans in New York City, have strengthened community ties through a network of community gardens. Gardens can also serve as melting pots for mixed communities. An example is the Garden of Happiness in the Bronx, New York, where African-American and Dominican managers welcomed new Mexican immigrants. Project support was provided by the national Urban and Community Forestry program of the USDA Forest Service, State and Private Forestry. Summary prepared by Kathleen Wolf, Ph.D. and Mary Ann Rozance, M.S., May 20, 2013. 1. Sullivan,WC, FE Kuo, and S DePooter. 2004. The Fruit of Urban Nature: Vital Neighborhood Spaces. Environment and Behavior 36, 5:678-700. 2. Kuo, FE, WC Sullivan, RL Coley, and L Brunson. 1998. Fertile Ground for Community: Inner-City Neighborhood Common Spaces. American Journal of Community Psychology 26, 6: 823-851. 3. Coley, RL, FE Kuo, and WC Sullivan. 1997. Where Does Community Grow? The Social Context Created by Nature in Urban Public Housing. Environment and Behavior 29, 4:468-492. 4. Taylor, AF, A Wiley, FE Kuo, and WC Sullivan. 1998. Growing Up in the Inner City. Environment and Behavior 30, 1:3-27. 5. Kweon, BS, WC Sullivan, and R Angel. 1998. 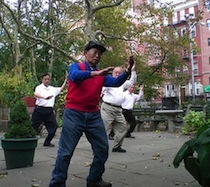 Green Common Spaces and the Social Integration of Inner-City Older Adults. Environment and Behavior 30, 6:832-858. 6. Sampson R, J Morenoff, and T Gannon-Rowley. 2002. Assessing "Neighborhood Effects": Social Processes and New Directions in Research. Annual Review of Sociology 28:443-478. 7. Cubbin, C, S Egerter, P Braveman, and V Pedregon. 2008. Where We Live Matters for Our Health: Neighborhoods and Health. Issue Brief 3 of the Robert Wood Johnson Foundation, Commission to Build a Healthier America, 11 pages. 8. Wood, L, and B Giles-Corti. 2008. Is There a Place for Social Capital in the Psychology of Health and Place? Journal of Environmental Psychology 28, 2:154-163. 9. McMillan, DW, and DM Chavis. 1986. Sense of Community: A Definition and Theory. Journal of Community Psychology 14:6-23. 10. Khan, NA.1999. Community Cooperation in a Voluntary Environmental Project: Some Lessons from Swansea, Wales. Community Development Journal 34, 3:205–218. 11. Kim, J, and R Kaplan. 2004. Physical and Psychological Factors in Sense of Community: New Urbanist Kentlands and Nearby Orchard Village. Environment and Behavior 36, 3:313-340. 12. Potapchuk, WR, JP Crocker, and WH Schechter Jr. 1997. Building Community with Social Capital: Chits and Chums or Chats with Change. National Civic Review 86, 2:129-139. 13. Marschall, MJ, and D Stolle. 2004. Race and the City: Neighborhood Context and the Development of Generalized Trust. Political Behavior 26, 2:125-153. 14. Peters, K, B Elands, and A Buijs. 2009. 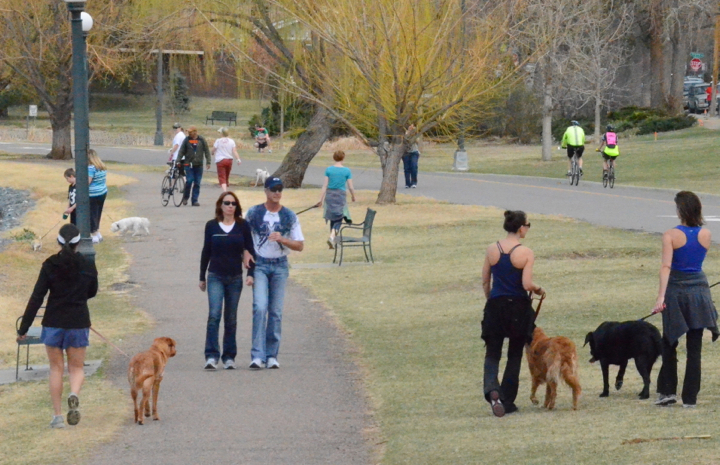 Social Interactions in Urban Parks: Stimulating Social Cohesion?" Urban Forestry & Urban Greening 9, 2:93-100. 15. Fainstein, SS. 2005. Cities and Diversity. Urban Affairs Review 41, 1: 3. 16. Kleinhans, R, H Priemus, and G Engbersen. 2007. Understanding Social Capital in Recently Restructured Urban Neighbourhoods: Two Case Studies in Rotterdam. Urban Studies 44, 5:1069-1091. 17. Lofland, LH. 1973. A World of Strangers: Order and Action in Urban Public Space. Basic Books, New York. 18. Stone, W, and J Hughes. 2002. Understanding Community Strengths: Can Existing Theories Provide An Overall Framework for Achieving and Identifying Strong Communities? Family Matters 62, 6:1-8. 19. Macionis, JJ, and LM Gerber. 2002. Sociology, Fourth Canadian Edition. Canada: Pearson. 20. Glover, TD. 2004. Social Capital in the Lived Experiences of Community Gardeners. Leisure Sciences 26, 2:143-162. 21. Coleman, JS. 1988. Social Capital in the Creation of Human Capital. American Journal of Sociology 94, 1:95-120. 22. Lin, N. 2002. Social Capital: A Theory of Social Structure and Action. Cambridge University Press. 23. Putnam, R. 2000. Bowling Alone: The Collapse and Revival of American Community. New York: Simon and Schuster. 24. Case, AC, and LF Katz. 1991. The Company You Keep: The Effects of Family and Neighborhood on Disadvantaged Youths. NBER Working Paper 3705, National Bureau of Economic Research. 25. Sabin, EP. 1993. Social Relationships and Mortality Among the Elderly. Journal of Applied Gerontology 12, 1:44-61. 26. Engedal, K. 1996. Mortality in the Elderly: A 3-Year Follow-Up of An Elderly Community Sample. International Journal of Geriatric Psychiatry 11, 5:467-471. 27. Steinbach, U. 1992. Social Networks, Institutionalization, and Mortality Among Elderly People in the United States. Journal of Gerontology 47, 4:S183-90. 28. Durkheim, E. 2002. Suicide: A Study in Sociology. New York: Psychology Press, 432 pages. 29. Lester, D, and F Moksony. 1994. The Social Correlates of Suicide in Hungary in the Elderly. European Psychiatry 9, 6:273-274. 30. Lee, GR. 1983. Integration and Fear of Crime Among Older Persons. Journal of Gerontology 38, 6:745-50. 31. Ross, CE, and SJ Jang. 2000. Neighborhood Disorder, Fear, and Mistrust: The Buffering Role of Social Ties With Neighbors. American Journal of Community Psychology 28:401-420. 32. Takano, T, K Nakamura, and M Watanabe. 2002. Urban Residential Environments and Senior Citizens’ Longevity in Megacity Areas: The Importance of Walkable Green Spaces. Journal of Epidemiology and Community Health 56, 12:913-16. 33. Sampson, RJ, SW Raudenbush and F Earls. 1997. Neighborhoods and Violent Crime: A Multilevel Study of Collective Efficacy. American Association for the Advancement of Science 277, 5328:918-924. 34. Bellair, PS. 1997. Social Interaction and Community Crime: Examining the Importance of Neighbor Networks. Criminology 35:677-704. 35. Hirschfield, A, and KJ Bowers. 1997. The Effect of Social Cohesion on Levels of Recorded Crime in Disadvantaged Areas. Urban Studies 34, 8:1275-1295. 36. Ross, CE. 2000. Neighborhood Disadvantage and Adult Depression. Journal of Health and Social Behavior 41, 2:177-187. 37. Cutrona, CE, DW Russell, RM Hessling, PA Brown, and V Murry. 2000. Direct and Moderating Effects of Community Context on the Well-Being of African American Women. Journal of Personality and Social Psychology 79, 6:1088-1101. 38. Aneshenel, CS, and CA Sucoff. 1996. The Neighborhood Context of Adolescent Mental Health. Journal of Health and Social Behavior 37:293-310. 39. Lochner, KA, I Kawachi, RT Brennan, and SL Buka. 2003. Social Capital and Neighborhood Mortality Rates in Chicago. Social Science & Medicine 56, 8:1797-805. 40. Veenstra, G. 2002. Social Capital and Health (Plus Wealth, Income Inequality and Regional Health Governance). Social Science & Medicine 54, 6:849-68. 41. Pollack, CE, and O von dem Knesebeck. 2004. Social Capital and Health Among the Aged: Comparisons Between the United States and Germany. Health & Place 10, 4:383-391. 42. Kawachi, I, BP Kennedy, and R Glass. 1999. Social Capital and Self-Rated Health: A Contextual Analysis. American Journal of Public Health 89, 8:1187. 43. Holtgrave, DR, and RA Crosby. 2003. Social Capital, Poverty, and Income Inequality As Predictors of Gonorrhoea, Syphilis, Chlamydia and AIDS Case Rates in the United States. Sexually Transmitted Infections 79, 1:62-4. 44. Bolin, K, B Lindgren, M Lindström, and P Nystedt. 2003. Investments in Social Capital-Implications of Social Interactions for the Production of Health. Social Science & Medicine 56, 12:2379-90. 45. Moffitt, TE, and E-Risk Study Team. 2002. Teen-Aged Mothers in Contemporary Britain. Journal of Child Psychology and Psychiatry, and Allied Disciplines 43, 6:727-42. 46. Felton, BJ, and M Shinn. 1992. Social Integration and Social Support: Moving “Social Support” Beyond the Individual Level. Journal of Community Psychology 20, 2:103-115. 47. Kennedy, BP, and I Kawachi. 1998. The Role of Social Capital in the Russian Mortality Crisis. World Development 26, 11:2029-2043. 48. Ziersch, AM, FE Baum, C MacDougall, and C Putland. 2005. Neighborhood Life and Social Capital: The Implications for Health. Social Science & Medicine 60:71–86. 49. Halpern, D. 1995. Mental Health and the Built Environment: More Than Bricks and Mortar? London: Taylor & Francis. 50. Runyan, DK, WM Hunter, RRS Socolar, L Amaya-Jackson, D English, J Landsverk, H Dubowitz, DH Browne, SI Bangdiwala, and RM Mathew. 1998. Children Who Prosper in Unfavorable Environments: The Relationship to Social Capital. Pediatrics 101, 1:12-18. 51. Brunson, L, FE Kuo, and WC Sullivan. 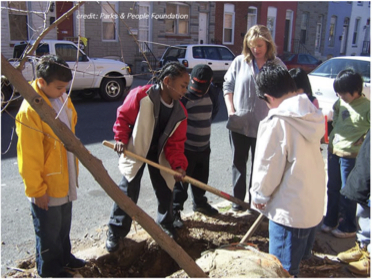 Sowing the Seeds of Community: Greening and Gardening in Inner-City Neighborhoods. unpublished manuscript, University of Illinois. 52. Lomas, J. 1998. Social Capital and Health: Implications for Public Health and Epidemiology. Social Science & Medicine 47, 9:1181-1188. 53. Ruberman, W, E Weinblatt, JD Goldberg, and BS Chaudhary. 1984. Psychosocial Influences on Mortality After Myocardial Infarction. New England Journal of Medicine 311, 9:552-59. 54. Dinnie, E, KM Brown, and S Morris. 2013. Community, Cooperation and Conflict: Negotiating the Social Well-being Benefits of Urban Greenspace Experiences. Landscape and Urban Planning 112:1-9. 55. Tidball, KG. 2010. Greening in the Red Zone: Green Space and Disaster Resistance, Recovery and Resilience. Anthropology News October:10-11. 56. Tidball, KG. 2012. Urgent Biophilia: Human-nature Interactions and Biological Attractions in Disaster Resilience. Ecology and Society 17, 2:5. 57. Jamison, MS. 2005. The Joys of Gardening: Collectivist and Bureaucratic Cultures in Conflict. Sociological Quarterly 26, 4:473-490. 58. Platt, RH. 2004. Land Use and Society: Geography, Law, and Public Policy. Washington DC, Island Press, 488 pages. 59. Saldivar-Tanaka, L, and ME Krasny. 2004. Culturing Community Development, Neighborhood Open Space, and Civic Agriculture: The Case of Latino Community Gardens in New York City. Agriculture and Human Values 21, 4:399-412. 60. Francis, M, L Cashdan, and L Paxson. 1984. 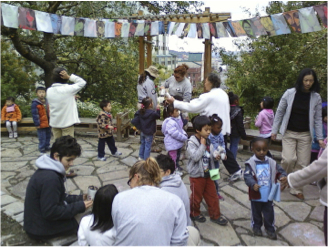 Community Open Spaces: Greening Neighborhoods Through Community Action and Land Conservation. Washington D.C., Island Press. 61. Twiss, J, J Dickinson, S Duma, T Kleinman, H Paulsen, and L Rilveria. 2003. 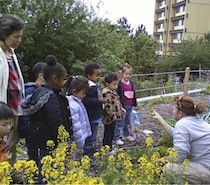 Community Gardens: Lessons Learned From California Healthy Cities and Communities. American Journal of Public Health 93, 9:1435-1438. 62. Malakoff, D. 1995. What Good Is Community Greening? Community Greening Review 5:4-11. 63. Bicho, AN. 1996. The Simple Power of Multicultural Community Gardening. Community Greening Review 6:2-11. 64. Schukoske, JE. 1999. Community Development Through Gardening: State and Local Policies Transforming Urban Open Space. Legislation and Public Policy 3:351-392. 65. Wakefield, S, F Yeudall, C Taron, J Reynolds, and A Skinner. 2007. Growing Urban Health: Community Gardening in South-East Toronto. Health Promotion International 22, 2:92-101. 66. Kurtz, H. 2002. Differentiating Multiple Meanings of Garden and Community. Urban Geography 22, 7:656-670. 67. Alaimo, K, TM Reischl, and JO Allen. 2010. Community Gardening, Neighborhood Meetings, and Social Capital. Journal of Community Psychology 38, 4:497-514. 68. Blair, D, CC Giesecke, and S Sherman. 1991. A Dietary, Social and Economic Evaluation of the Philadelphia Urban Gardening Project. Journal of Nutrition Education 23,4:161-167. 69. Armstrong, D. 2000. A Survey of Community Gardens in Upstate New York: Implications for Health Promotion and Community Development. Health and Place 6, 4:319-27. 70. Wakefield, SEL, SJ Elliott, and DC Cole. 2007. Social Capital, Environmental Health and Collective Action: A Hamilton, Ontario Case Study. Canadian Geographer 51, 4:428-443. 71. Krenichyn, K. 2004. Women and Physical Activity in An Urban Park: Enrichment and Support Through An Ethic of Care. Journal of Environmental Psychology 24, 1:117-130. The City of Seattle operates the “P-Patch” Community Gardening Program, founded through volunteer efforts in 1973. 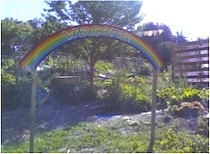 In 1975, the city first purchased land for community gardens. In 1992, the Seattle City Council recommended that gardens be included in the city’s comprehensive plan. There are now 73 P-Patches totaling 23 acres and serving 2,056 households: see www.cityofseattle.net/neighborhoods/ppatch/.